Jerome had been looking for a exit plan to end his life of drugs, alcohol and hopelessness. Addicted to prescription drugs and alcohol for more than 30 years, he made a decision to change his life. 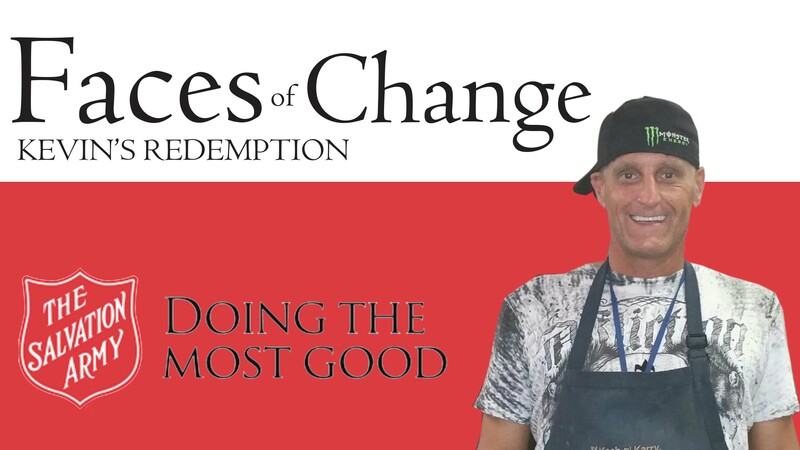 Jerome entered the Adult Rehabilitation Center (ARC) in Tampa in 2014 and spent the year rebuilding his life. 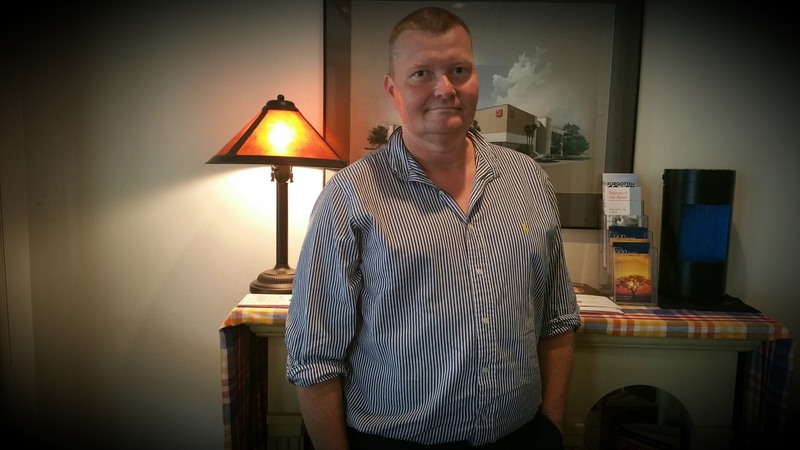 Jerome was able to end his years of drug and alcohol abuse with the help of the ARC. But he realized quickly upon his completion of the program that he was not ready to face his new world. “Problem was I didn’t make an exit plan. I didn’t want to let them know that I didn’t do my homework and figure things out,” Jerome said. The night Jerome left the ARC was cold. He had no plan, no one to call and nowhere to go. After two nights on the streets, he decided it was time to go back to The Salvation Army, to see if they could help him for good. Throughout the time Jerome was on the streets, he didn’t go back to drugs and alcohol. The tough part would be overcoming his internal struggles and finding stable employment. Jerome was able to enter The Salvation Army in Tampa’s Homeless Transition Program, a 45-day program designed to provide job training and housing resources to the homeless. Though Jerome was able to find work, his anxiety and self-esteem kept him stuck. 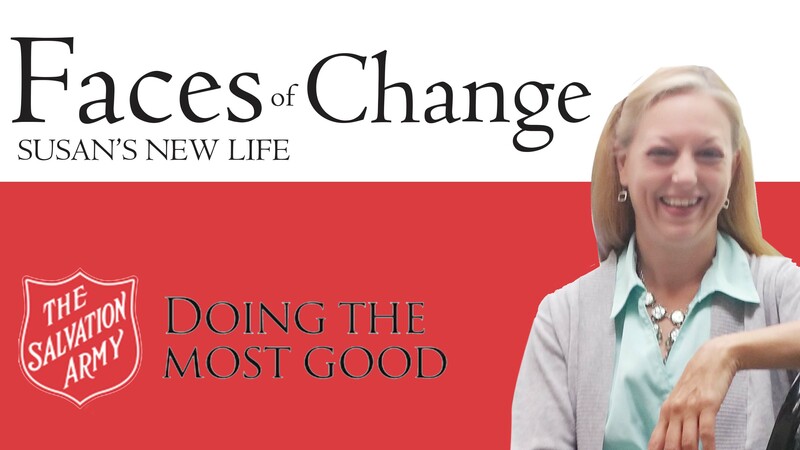 Little-by-little he began to apply the advice and love given to him by the case managers at The Salvation Army. “Ladies, the financial literacy class is going to start at 9 (a.m.),” is the first sentence Susan speaks in the P.A. system starting her work day as the Housing Monitor at the Hospitality House, The Salvation Army in Tampa’s women’s transitional facility. The 52-year-old native Floridian, who spent most of her youth in Tampa, has only worked at The Salvation Army since January, but she is glad to find a place to finally call home. Susan was raised in a very conservative household. Her father was a pastor who traveled throughout the state whenever he received a new clergy position. So from a young age Susan understood right from wrong and tried to stay on that path each day. “I couldn’t do things that other kids could do growing up, like dances and movies,” she said. Susan went to the University of Central Florida after high school and eventually got married and started her family in Orlando. However, a divorce would leave her single and caring for a little girl alone. So she quit college to work a full-time job and take care of her daughter. Now with two daughters, 21 and 6 years old, Susan life had become a steady pace of family and work, until two years ago when she reconnected with a high school sweetheart from Tampa. After a year-long courtship, the two were engaged and were living in Tampa to start their new family. However, during their engagement Susan’s new fiancé cheated, forcing her to leave the home they shared to find a new job and home. “I left the home I stayed with him and his parents. I had savings, but it was all used it to support me and my kids in an Extended Stay for a month,” Susan said. Susan tried to find apartments in Tampa, but she could not qualify because she either didn’t make enough money or didn’t have suitable rental references or history. Susan was able to briefly stay with a church friend, but couldn’t stay long because the rental facility didn’t allow subleasing. She was now back to square one. No money and no home. At this point Susan only had money for a three-night stay at a hotel for her and her daughters. “The place I stayed in was so filthy and was filled with roaches, she said. Susan spent that Monday driving around Tampa to look for a place to stay. She checked various shelters throughout the city, like Metropolitan Ministries, but they all gave her an appointment to come back in three weeks. Susan continued to drive and pray that day hoping she could find anything. Susan didn’t know what to do. But as she was a driving a familiar sign stopped her in her tracks. Just six months at our women’s transitional facility, Susan went back to college and started working part time at The Salvation Army in Tampa. “At first I was like is this how I am supposed to end up. I thought I was doing the right thing and living my life the right way,” she said. Kevin began his life of drugs at age 14, and by age 16 was already addicted to alcohol, marijuana and heroin. And in 2014 he found himself homeless living in a metal shed, jobless and hopeless. Though he was raised by loving Christian parents and grandparents, he couldn’t stay away from a dangerous lifestyle filled with drugs and alcohol. For many years Kevin was still able to keep a good-paying job, which helped fuel his drug-induced lifestyle. “I was really about that life. Then it all came tumbling down,” Kevin said. After a failed suicide attempt, he went to Springbrook Psychiatric Hospital in Brooksville, Florida. A social worker there then suggested he go to the Red Shield Lodge at The Salvation Army in Tampa/Hillsborough County. Counselors from the Red Shield Lodge told him about the Adult Rehabilitation Center (ARC) in Tampa, which became the turning point of Kevin’s life. “When I walked into the ARC, I was totally broken down with just the clothes on his back. They started off by giving me clothes, food and structure. Then the ARC gave me a safe environment and helped me get back on track,” he said. Kevin started attending Alcoholics Anonymous meetings while at The ARC. He worked the 12 steps on alcoholics anonymous with his counselor from the ARC and regained his life for the first time in 32 years without drugs or alcohol. He was at the ARC for six months. Kevin loves the way his life is now. His family is talking to him again. Friends have circled back into his life. And he is living happy, joyous and free. He even volunteers in the kitchen at The Salvation Army in Tampa to give back. More than a dozen students from the University of Tennessee came to Tampa, March 15-21, looking for ways to help abused and abandoned animals. Though their primary reason for the week was to serve rescued animals during their spring break, the students discovered another mission that also touched their hearts. “We called 40 housing sites in the area to see if anyone would let us sleep for the week while we helped in different animal shelters in the area, and everyone turned us down. The Salvation Army was the only place that would give us a place to stay. Major Leisa Hall was so nice to us,” said Matthew Klein, a junior nutrition student at The University of Tennessee. The students also volunteered their time at The Salvation Army in Tampa . They cooked and cleaned for the nearly 250 residents staying in our facility each night. “It was amazing being able to cook for nearly 1,500 people during the week. I was so happy to help,” Klein said. This was Klein’s first Alternative Spring Break while at the university, but says he would do it again — for the animals and residents at The Salvation Army in Tampa. Condreana Rymer, an animal science sophomore, enjoyed being a part of helping rescued animals in Tampa and those in need in our shelters. “It was great seeing everyone (residents) happy that we were here, and it was great making a positive impact on the animals and the people living here,” Rymer said. For Chelsea DeBlock, the experience was different than what she expected. “The rooms were bigger than what I expected, we got full kitchen range, and the staff members were so kind,” said DeBlock, an animal science freshmen. “It was great hearing the stories of the women in the transitional housing. Their stories were inspiring. I had a good time and made great friendships. I hope to come back again. When I first heard about the Salvation Army, I instantly thought of their thrift stores and emergency shelters. After my first day of orientation as an intern at the Salvation Army of Tampa, I was amazed by all of the services they have to offer. What I didn’t know about the Salvation Army of Tampa is their Hospitality House. The Hospitality House is a woman’s transitional housing program for homeless women and children. It is a six-month up to two-year program used to help individuals and families make a transition from homelessness to independent living. In the Hospitality Housing there are about 50 beds that are sectioned off for single women and women with children. During the program, the residents are given resources and guidance to help them reach their goal into independent living. The Salvation Army provides them with case management, counseling, budgeting and parenting classes, and many other resources. My first two days at the Salvation Army, I was training with the Housing Monitor. The Housing monitor usually interacts with the residents the most throughout the day. I’ve met extraordinary women and watched them be each other’s support system. Most of the women there have part-time or full-time jobs to support themselves. I’ve seen some who have been going to job interviews and working on their resumes in order to reach their next step. It’s honestly a rewarding feeling, to know that I’m with an organization that contributes to the growth and overall well-being of people. They truly embrace the mission of The Salvation Army in Hillsborough County to save souls, grow saints and serve suffering humanity.